While the security flaw affected all desktop versions of Chrome, it was especially a problem for Windows users, as it formed part of a more complex attack against Windows 7. The older Microsoft operating system had its own zero-day flaw identified at the same time as the Chrome version, with the browser's flaw actively used as part of a more complex attack against Windows, reports CNET. Google updated its announcement for the patch to advise the exploit against Chrome "exists in the wild." 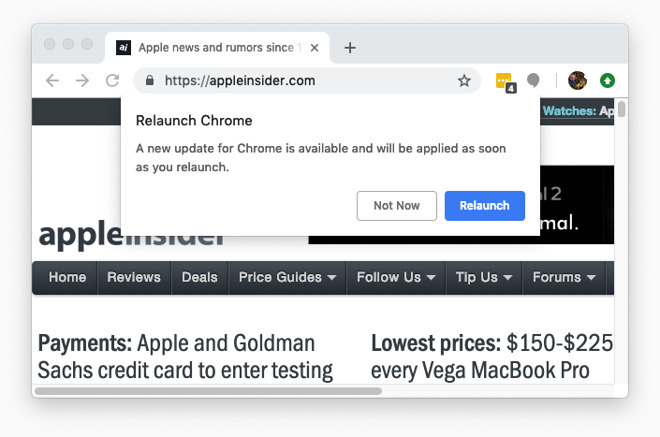 Justin Schuh, head of Google's Chrome Security, posted to Twitter advising of both the exploit's existence and advising users to update their browser with the new patch. The issue lies in a memory management error for Chrome's FileReader API, which allows web apps to read local files on a desktop. Specifically, it is a memory error known as a "use-after-free" vulnerability when a web app attempts to access memory that had been freed or deleted from Chrome's allocated memory, with the flaw enabling malicious code to be executed. Clement Lecigne of Google's Threat Analysis Group is credited as the researcher who found the bug. And if you need Chrome installed just use Chromium. It’s the open source base Chrome is built on. It’s missing all of Google’s tracking junk. Google is a legal spyware. I never use a product coming from this company. I have some sites that I’m required to use for work that require “Internet Explorer or Google Chorme.” (Yes, I know IE has been deprecated by MS.) That means I’m required to use Chrome on macOS. I haven’t checked to see if chromium will work, but I’d be willing to bet that the same security flaw announced here was also present in chromium. Also, if this was being actively exploited, why wasn’t there an announcement about it so people could avoid using Chrome until it was patched? Google just got done publicizing a security flaw in macOS that wasn’t being exploited because Apple ‘wasn’t quick enough’ with a patch. Seems rather hypocritical for them to hide an active exploit. No google chrome, no google maps, no google web search. Life is just fine with our google. What is it, exactly, that everyone is afraid of Google getting a hold of? You think Google is the only entity in the world that is "spying" (collecting data) on you? Ever go out in public, per chance, or just sit behind your "safe Mac" your whole life? I don't care. I'm a grain of sand on a beach. It's not so much (necessarily) what they're getting (everything) or even what they're using it for (mostly marketing but also some darker stuff, like how to manipulate people) as it is simply this -- they didn't ask permission, they're not transparent about what they do with that data (and all that they collect), and considering the money they're making on it, shouldn't I be getting a share of that? If FaceBook wasn't around, Google would be getting all the scrutiny and bad press. I use DuckDuckGo. I don't have any Google products on my devices or in my home or office. FaceBook has 29,000 data points on every individual! You really don't see a problem with that? All I want is 'transparency, 'accountability,' and 'rule of law.' In other words, responsible corporate citizens. Facebook, Google, Twitter and Amazon are the cigarette companies of the 80's and 90's. Cool. Then you should feel comfortable telling me at a minimum your real name and address? BTW Gruber and Rene Richie were talking on the latest episode of The Talk Show about how the so-called anonymization by companies like Google and Facebook is easily circumvented by advertisers and metrics companies who figure out ways to link users to a specific identifying data point, and then create "shadow profiles" of you from there. Fun stuff, kids. You are the product. OK technically I get ads, but I don’t see them because they go directly to my Junk folder. What's unfortunate is that thinking that Chrome (or Firefox) are superior to Safari, and vice versa. All are modern browsers and each adds features and conveniences over the other. I prefer Safari's "feel", but Chrome and Firefox have closed the gap. I still don't like Firefox's text rendering... it's different and seems slightly off. I use Safari as my main browser, but have Chrome and Vivaldi ready to launch for other purposes. I use Netflix in Chrome, for example. I treat browsers like application wrappers so I can Cmd-Tab between them. I use multiple windows to organize related pages. People that open every single web page in a separate tab and never use multiple windows are missing out. Tabs do not replace multiple windows entirely like many people choose to believe. Lose the "one single browser" mentality and the world will be a happier, more productive place. "and considering the money they're making on it, shouldn't I be getting a share of that?	" We need either a Federal law or even better a Constitutional Amendment that grants every citizen absolute ownership of their personal data. No use of that data without remuneration. No use of SSN without tokenization like Apple Pay or similar. Companies should not be indemnified if they lose the data we have allowed them to use. No enitiy is entitled to our data. They have taken it because no one has stood up and stoppped them. -Are you talking a cash payment only or is a trade for services rendered OK? -Is profit allowed or are you expecting break-even? -What about the credit bureau's, banks, and other lenders who use your personal data to evaluate you for extending credit? -Would it be OK for you as an employer to do a background check, or for an insurer to check your driving history and accident record? All these things require that your personal data be stored somewhere. Is signing your agreement to access it sufficient or are you still demanding to be paid in actual money? A lot of questions are raised by what you think is a simple matter. I look forward to your comment. So one justifies the other? Really? That's like saying getting stabbed is alright because its not as bad as getting shot.